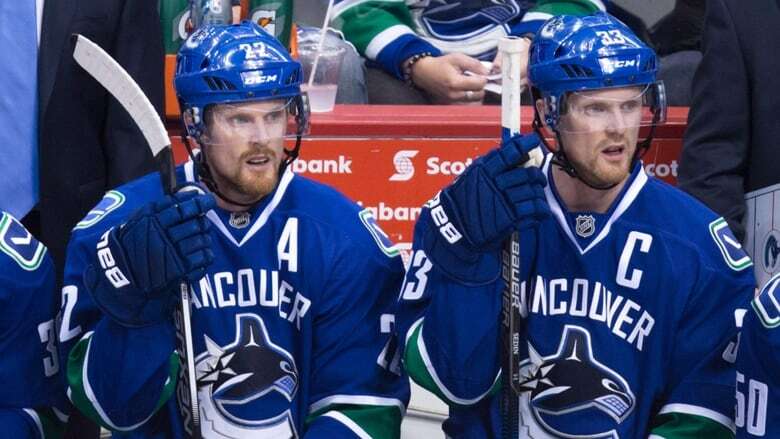 Heading into the final year of their contracts with the Vancouver Canucks, Henrik and Daniel Sedin penned a passionate letter to fans on the eve of training camp. In the piece that appeared on The Players' Tribune website Monday, the twins expressed their desire to remain with the only NHL franchise they've ever known — even if it means forgoing the chance at a Stanley Cup with another club. "It wouldn't be the same to win somewhere else," Daniel Sedin reiterated Tuesday as players gathered at Rogers Arena for testing and physicals. "We've been here so long. "This city has meant so much to us." While it no doubt came from the heart, the online post was also a calculated attempt by the soon-to-be-37-year-old forwards to control the narrative regarding their futures with the rebuilding Canucks. It probably won't work, especially with the team unlikely to contend for some time, but credit them for trying. "There's going to be questions all season," said Henrik Sedin. "It was a way for us to show people our mindset and how we felt about it. "I hope the message came across the right way." Gone are the days of dominance where the Sedins consistently put up big numbers — Henrik had 51 points last season, while Daniel recorded just 44, his lowest total since 2002-03. The Sedins are confident they will rebound, and Canucks general manager Jim Benning opened the door for the pair to return next year on new deals. He also quashed any notion the faces of the franchise for more than a decade would be asked to waive their no-movement clauses if Vancouver is, as expected, out of the playoff picture at the trade deadline. "They're great people and they've been great players for our organization," said Benning. "They help with the younger players, set the example of what it means to be a pro. "That's just typical of what they're all about." What the Canucks have been the last two seasons is among the doormats of the NHL as a flood of veterans from the club's run to the 2011 final moved on with the championship window slammed shut. Vancouver has missed the playoffs three of the last four springs, finishing 28th overall in 2015-16 before a 29th-place showing in an injury-riddled 2016-17 campaign. The axe fell on head coach Willie Desjardins in April, paving the way for Travis Green to take charge with his first NHL job after four seasons behind the bench of the club's AHL affiliate. Management finally embraced the "rebuild" term publicly late last season, a shift that many observers viewed as a sign the team would infuse more youth into the lineup. But the Canucks made a number of veteran free-agent signings over the summer, including forwards Sam Gagner and Alexander Burmistrov, as well as defenceman Michael Del Zotto, before adding winger Thomas Vanek on Sept. 1. That left many to wonder where prospects like Brock Boeser, Jake Virtanen, Olli Juolevi and Jonathan Dahlen, among others, will fit if and when they're ready. "We've said we want to get younger, but it's a fine line between throwing guys into the deep end before they're ready to swim," said Green, a former NHLer and the Canucks' fourth coach in six years. "Young guys are going to make some mistakes. "It's whether they're capable of learning from their mistakes and moving on and getting better so they're not continuing to make those mistakes." The current established young core includes Bo Horvat, who signed a six-year, $33-million US contract last week, along with fellow forwards Sven Baertschi and Markus Granlund, and defencemen Ben Hutton and Troy Stecher. Jacob Markstrom, meanwhile, looks primed to take over the bulk of the load in the crease after veteran goalie Ryan Miller signed with the Anaheim Ducks. "We haven't had the greatest past two years, but we've made some great additions," said the 22-year-old Horvat. "They're going to bring a lot of depth and energy to our team. "I think we're going to do really well this year." That could be a stretch. If not for the lowly Colorado Avalanche, the Canucks would have wound up last in a number of offensive categories last year. Vancouver finished 25 points back of the final playoff spot in the Western Conference and were the owners of a historically inept attack that set a franchise record for futility with just 178 goals. The Canucks's stale and unimaginative power play ranked 29th overall, while the penalty kill wasn't much better at 28th. Optimism oozes out of every NHL locker-room at this time of year, and despite the projections on the outside, the Canucks are no different. "We all want to take another step," said Daniel Sedin. "I think we're on the way up." And while they want to continue on in Vancouver, whether the Sedins — who don't have any intention of retiring — are here to see the climb continue after this season is anyone's guess.